For several months in 1989, the 1,200 residents in White River, Ontario, were locked in a battle with the giant Disney Corporation. The fuss was over a whimsical and much-beloved bear. 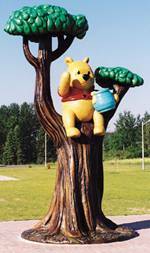 White River wanted to erect a statue honouring Winnie the Pooh, the honey-loving bear that author A.A. Milne based his best-selling story on. The inspiration for the character of Winnie in Winnie the Pooh came from a real-life bear born in White River who later ended up in the zoo in London, England. The bear was given to the zoo by Canadian Army veterinarian Lieutenant Harry Colebourn who bought the bear cub on the railway platform in White River in 1914 for $20. He named the bear "Winnie" after his hometown of Winnipeg. The bear became the mascot of Colebourn&rsquo;s regiment when they were called overseas to fight in the first World War. But when the regiment was sent to France for active duty, Colebourn gave the bear to the zoo where it would be safe. It was while the bear from White River was living in the London Zoo that Milne and his son became infatuated with its whimsical ways. 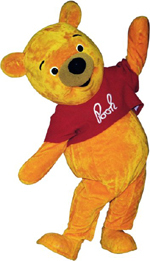 Milne wrote Winnie the Pooh to entertain his son and gave the young boy in the book his son's real name - Christopher Robin. The story became an instant best-seller around the world. In 1977, Walt Disney debuted the entire Winnie the Pooh cast of characters that includes Pooh Bear, Piglet, Tigger, Owl, Rabbit, Eeyore, Kanga and Roo to movie audiences. As for White River, it did get its statue of the bear loved all over the world. To this day, the town is remembered as the birthplace of Winnie the Pooh and there's a statue of the bear at the train station to honour his memory. White River also has an annual Winnie's Hometown Festival. This year is the 10th anniversary of the festival which runs from August 14 to 16. As Winnie himself just might say: "Oh my."